Consider this the conclusion of my summer hummingbird trilogy. They really are amazing creatures. 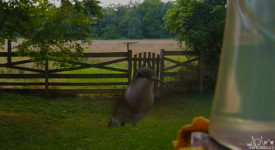 Ruby-Throated Hummingbirds are fairly common in central Maryland. Here is another video I took, with the camera sometimes only inches away, of them drinking from artificial nectar feeders. Turn your volume up and you can hear them chirp and buzz. 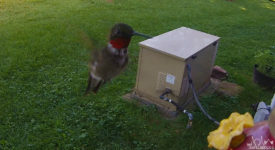 Ruby-Throated Hummingbirds are fairly common in central Maryland. 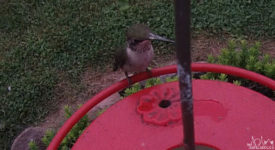 Here is some video, with the camera sometimes only inches away, of them drinking from artificial nectar feeders. Turn your volume up and you can hear them chirp and buzz.